The shoulder is one of the most mobile joints in the body and also one of the most unstable. Shoulder instability due to ligament laxity is the primary cause of the majority of shoulder pain conditions, yet goes undiagnosed in many cases. This leads to patients receiving cycles of degenerative treatments like cortisone injections and ibuprofen to mask pain, or rounds of physical therapy to address the muscles but none of these address can correct ligament laxity and degeneration. Degenerative conditions need regenerative solutions! Since 1993, Caring Medical has been a leader in comprehensive Prolotherapy (including Platelet Rich Plasma and Stem cell therapy) to effectively eliminate both acute and chronic shoulder pain without surgery. Our team helps all types of shoulder conditions including osteoarthritis, rotator cuff tear, ac sprain, glenoid labrum tear, frozen shoulder, tendinopathy, and more. Navigate through the sections below for lots of shoulder pain information or get help from our medical staff now. These symptoms can be signs of the following shoulder pain conditions caused by shoulder instability and respond well to comprehensive Prolotherapy treatment. To fix shoulder joint instability, the ligamentous and shoulder capsular structures must be strengthened. The main capsular structure involved in the stability of the shoulder is the glenoid labrum, which holds the humerus bone to the glenoid cavity of the scapula. Other common reasons for shoulder joint instability involve weakness in the supraspinatus tendon, acromioclavicular ligament laxity, a weakened glenohumeral ligament, and weakness of the structures that attach to the coracoid process. 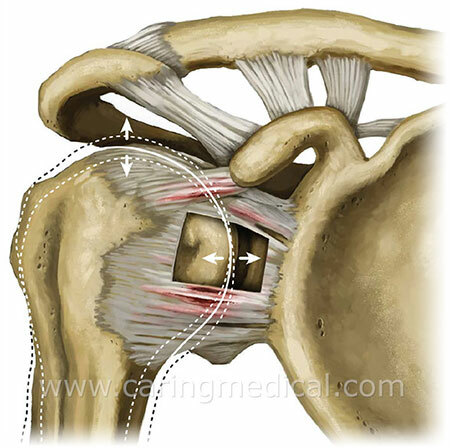 A shoulder is usually unstable because these structures are torn or stretched. Once these structures are stretched or loosened, no amount of exercise will strengthen the shoulder joint enough to permanently hold it in place. The pulley complex is composed of the superior glenohumeral ligament, the coracohumeral ligament, and the distal attachment of the subscapularis tendon. 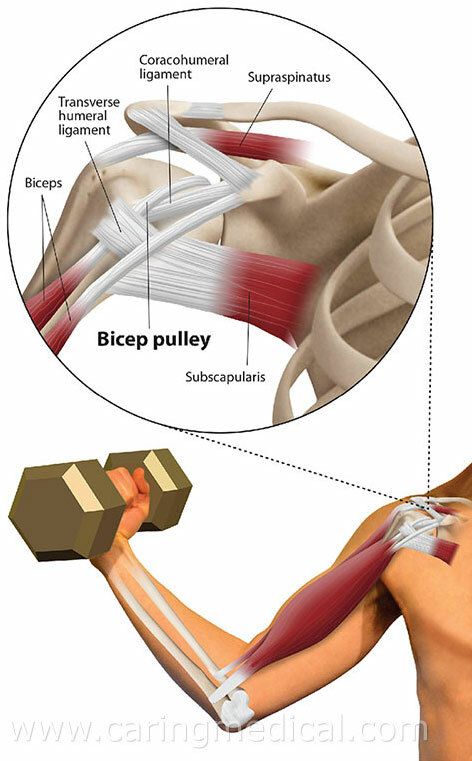 Any type of shoulder instability, including injury to this capsuloligamentous complex that makes up the biceps pulley system can result in any type of biceps tendon lesion including tears, degeneration, or calcification. Ligament injury is what causes the mechanical instability and proprioceptive deficits that leads to joint mechanical and functional instability (in the shoulder and other joints). Prolotherapy should be started first before rehabilitation because muscles can’t be adequately strengthened and rehabilitated when the joint they move is unstable. Prolotherapy injections are a more advanced, yet non-surgical, approach that directly stimulate repair of the structures. 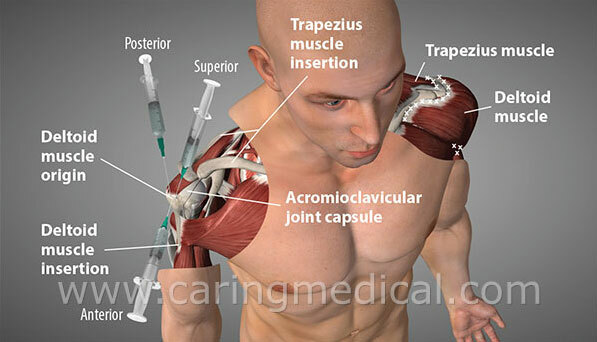 The injections are done around the entire shoulder, depending on where the weakness and instability is located directly to the ligament and tendon attachments. This stimulates the body to re-initiate the natural healing cascade to areas that otherwise are not healing on their own. Patients are able to continue working and conducting activities of daily living during the treatment series. Usually, within a few treatments, the tissue has strengthened enough to eliminate pain and provide a stable base for the muscles to resume a high level of activity again, making it ideal for athletes and those who do physical and overhead work. 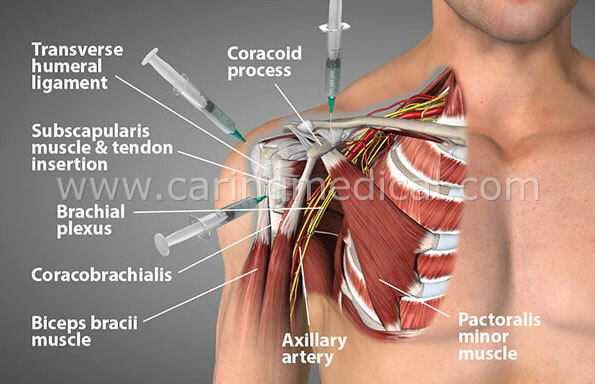 Frequent sites of injection are demonstrated, including the coracoid process, subscapularis tendon, and the greater tuberosity. Common sites of tenderness are marked along the scapular spine, clavicle, and deltoid insertion, the approaches to the acromioclavicular joint are demonstrated. In our retrospective observational study, patients with chronic shoulder pain reported significant improvements in many clinically relevant parameters and overall quality of life after receiving Hackett-Hemwall dextrose Prolotherapy. The complete study and results can be read here: Hauser R, Hauser M. A Retrospective Study on Hackett-Hemwall Dextrose Prolotherapy for Chronic Shoulder Pain at an Outpatient Charity Clinic in Rural Illinois. Journal of Prolotherapy. 2009;4:205-216. Pain scale is 1-10 where 1 = no pain & 10 = unrelenting pain. We get patient satisfaction results. 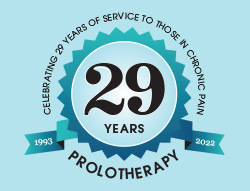 97% of patients in this study felt that Prolotherapy changed their life for the better and 97% have since recommended Prolotherapy to someone else. In our study on the effect of Prolotherapy treatment in 33 patients diagnosed with shoulder pain and glenoid labrum tears, patients reported overwhelmingly positive quantitative outcomes. Patient-reported quantitative outcomes for pain at rest and with activity, stiffness, range of motion (ROM), crunching on a 0-10 rating scale all improved after treatment. Additionally, of the 15 patients who were taking pills for symptom control prior to treatment, all but one were able to discontinue the use of their symptom-control medication post-treatment. The complete study and results can be read here: Hauser R, et al. Prolotherapy: A Non-Invasive Approach to Lesions of the Glenoid Labrum; A Non-Controlled Questionnaire Based Study. The Open Rehabilitation Journal. 2013;6:69-76. Pain scale is 0-10 where 0 = no pain & 10 = unrelenting pain. AL, with a history of Ehlers-Danlos Syndrome, had multiple shoulder dislocations despite 4 reconstruction surgeries, including a labral repair. AL’s shoulder was dislocating daily before coming for Prolotherapy. Because of her severe multidirectional instability, she required 12 Prolotherapy visits over the course of 12 months to stabilize her shoulder. Stabilization surgeries are often ineffective for patients with Ehlers-Danlos Syndrome. RS came to Caring Medical with severe pain and coldness in his right extremity, especially his shoulder, one year after a significant stroke left him weak on that side. On physical examination, a two finger-breath subluxation of his shoulder was noted, primarily due to the muscle atrophy caused by the stroke. After three Prolotherapy treatments and a short course of immobilization, the subluxation and radicular symptoms from Shoulder Hand Syndrome and the coldness and burning pain in the extremity due to Complex Regional Pain Syndrome had all completely resolved. Shoulder Hand Syndrome, like other chronic joint pain syndromes with autonomic nervous system involvement, has ligament laxity as a core etiologic factor, and requires Prolotherapy for resolution. LM is a 15 year old top-ranked swimmer who struggled to swim efficiently because of severe shoulder weakness and pain, which progressed to the point of her being unable to swim. Rest, physical therapy, massage and a cortisone injection did not bring relief. Her MRI showed evidence of tendonitis and a rotator cuff tear. Physical examination clearly revealed that she also had shoulder instability. After 9 Prolotherapy treatments over 5 months, LM regained her ability to swim the butterfly stroke, shaving 6 seconds off her time, enabling her to pursue a swimming scholarship with hopes of making the Olympic team. Traditional modalities were unable to treat the source of the injury. Prolotherapy repaired the injured rotator cuff and stabilized the shoulder. George was an active 64-year-old when he partially tore the rotator cuff in his left shoulder. He was prescribed an oral steroid and sent to physical therapy. Since he continued to have pain and limited range of motion, surgery was recommended by an orthopedic physician. 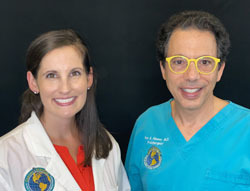 Seeking a surgical alternative, George began treatment with Caring Medical and received 5 rounds of comprehensive Prolotherapy with Platelet Rich Plasma. Prior to treatment with Caring Medical, George was limited in his exercise and unable to do a full pushup. He can now do sets of 30 pushups without pain! When a force is strong enough to tear the rotator cuff, there is usually ligament damage as well. Physical therapy is good for muscle problems, but cannot restore ligaments. This is why Physical Therapy alone can have limited results. Prolotherapy is an excellent application for rotator cuff tears. It stimulates repair of both the ligament and tendon tears directly. SR experienced unbearable shoulder pain for a year, related to a 25-year-old clavicle fracture she sustained from a bike injury. Her pain was constant and sharp, referring to her neck, chest and thoracic area and limiting motion. SR was only able to perform 50% of daily activities and the pain was hindering her ability play tennis. Her MRI showed bursitis, loose bodies, a labral tear and osteoarthritis. Surgery and Physical Therapy were recommended by another provider. As someone who worked in the field of Natural Medicine, SR was familiar with Prolotherapy, and chose the non-surgical option instead. Eight treatments were originally estimated to be necessary, but after only 3 PRP Prolotherapy treatments, SR reported vast improvement (over 90%), returned to playing doubles tennis twice weekly, in addition to golfing and enjoying a very active lifestyle. While her MRI showed 17 abnormalities, surgery was still not necessary. The body has incredible regenerative capabilities when a comprehensive enough treatment is performed and especially when the patient adheres to a healthy lifestyle that aids in faster healing. After 3 PRP Prolotherapy stimulated enough ligament repair to stabilize the shoulder and eliminate her local and referred pain. JM was diagnosed with a rotator cuff tear at age 55 after she developed shoulder pain which inhibited her ability to play golf as well as other activities. She had a cortisone injection with minimal relief and was referred for a surgical consult. The orthopedic recommended surgery to repair the tear, but JM consulted with Caring Medical for a second opinion and possible alternative. Along with a tailored exercise program to fit her needs, JM received 4 rounds of comprehensive Prolotherapy and Platelet Rich Plasma to her shoulder. She reported 100% improvement after her last treatment and was able to return to full activity! The typical pain management care sends patients down the road of receiving an MRI, cortisone injections, and a surgical consultation. The dangerous long-term consequence is that cortisone injections accelerate tissue degradation and arthritis. Prolotherapy is the opposite of cortisone. It stimulates tendon repair, and, in most cases, eliminates the need for rotator cuff tear surgery. At age 64, GD. woke up with shoulder pain and limited range of motion without any known cause. An orthopedic surgeon diagnosed him with a rotator cuff tear and recommended surgery. Since GD had received successful Prolotherapy treatments for other body areas at Caring Medical over the years, he politely declined surgery because he knew where else to go first! He was still very active, so his exercise routine was monitored by our team to ensure maximum benefit from treatment. Prior to treatment at Caring Medical, GD could not perform a full pushup. After 5 sessions of Prolotherapy with Platelet Rich Plasma, he is able to do 30 pushups without pain and plans to continue increasing his activity! No surgery needed! Just because a condition that can be treated with surgery is diagnosed, does not mean that the condition should be treated with surgery. Surgery is generally the last resort, even most surgeons would agree! In our experience with rotator cuff tears, PRP Prolotherapy is highly effective, as long as the joint is still comprehensively treated (injections performed into and around the entire joint) for maximum benefit. For 14 months, KS suffered with unrelenting shoulder pain with overhead movements, impeding her weight-lifting endeavors. The pain was unrelieved by physical therapy, chiropractic manipulation, or cortisone injection. Five Prolotherapy treatments resolved the symptoms, enabling KS to resume weight lifting activities. Although often helpful, Physical Therapy does not repair the injured ligaments that cause the instability of the shoulder that leads to degeneration of the tendons in impingement syndrome. Prolotherapy repairs the injured ligaments, as well as the degenerated tendons, bringing stability and regeneration to the joint. How well do you understand the cause of your shoulder pain? Take the Joint Instability Quiz! This quiz covers how musculoskeletal pain develops and which important diagnosis is often missing when people are suffering from chronic pain. 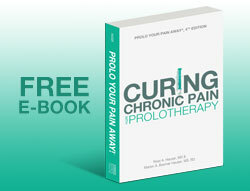 Read about treating shoulder pain with Prolotherapy in our free E-book, Prolo Your Pain Away! 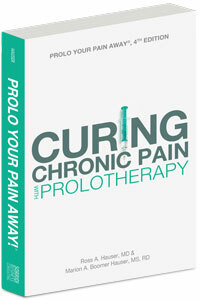 Curing Chronic Pain with Prolotherapy, 4th Edition. This edition explains all about Prolotherapy and how it is used to permanently alleviate pain from arthritis, sports injuries, and all types of chronic pain conditions! Plus, it takes an expanded look at the medical literature and patient studies on Regenerative Medicine: Prolotherapy, Platelet Rich Plasma, Stem Cell Therapy, and more! You deserve the best possible results from your shoulder pain treatment. Let’s make this happen! Talk to our team about your case to find out if you are a good candidate. What is the functional goal you are trying to achieve? 3. How can we best serve you? Were you referred to our office or how did you hear about us?